I have become a Google fan. It gives you everthing you need… Gmail – The mail cleint, Orkut – Social networking, Google Docs – Google office suit, Google Analytics – To analyze your website, Adsense – To make your website a source of income, and many many more. But the thing is the majority of even do not know how we can fully utilize the Google things. Today, I am going to share the Gmail features which have made me using Gmail more enjoyable and productive. There are a few additional stuffs I use with gmail which make my using gmail just more useful. First you need to know about Google labs.Google labs has stuff which Google users think it should have :). If you are going to use gmail labs for first time, then go to your “Settings” and acess “Labs” from there. The Wiki says “Google Labs is a website demonstrating and testing new Google projects”, so just take a note of this thing that Google labs may make your gmail unstable. But I haven’t faced any problem till now. Now we will begin with the Gmail stuff. Imagine you have been sent an invitation to view a Picasa Album, but you just want to have a preview of Snaps in the web album before deciding if you actaully want to view the whole album. This plugin helps you just doing that. 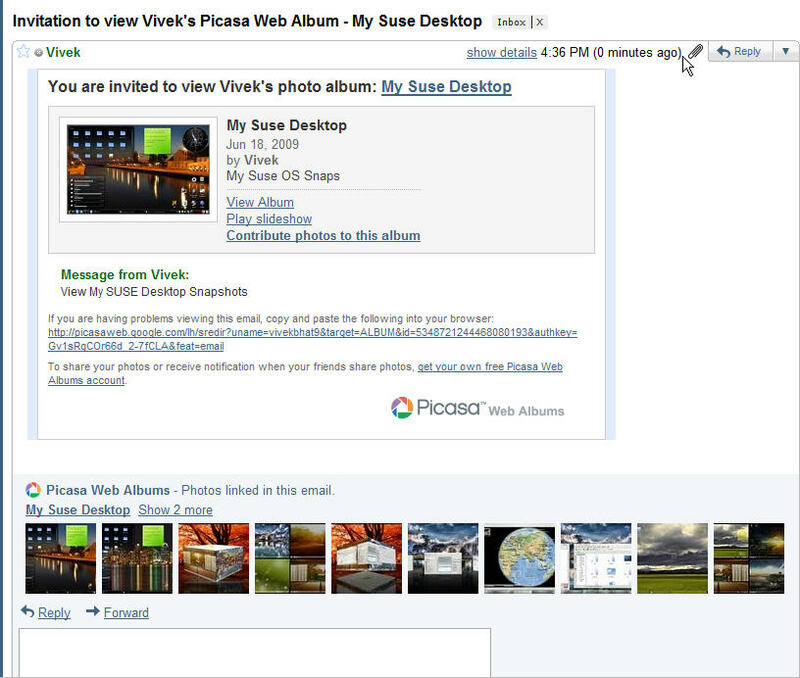 Enable “Picasa previews in email by Dan, Stanley Mark and Umesh”. And you will be able to see the Picasa Snaps previews just in your mail whenever you receive any invitation from anyone to view their picasa album. This plugin let’s you view Google Docs directly in your mail. Enable the plugin “Google Docs previews in mail”. And when you have “that” mail open click on “Add Quick Link” from “Quick Links” widget. A box will pop up confirming to add the quick link. Choose the name for your quick link there and click “OK”. Now you can access the quick link from the Quick Link widget on left side. How many times have you missed the variation in kind of “Stars” in Gmail. You can just start an item or not star it. Did you miss the functionality of having a graded start system, where you can set Red Star for an important mail, Green Star for a less important mail… Your search ends with this labs feature – Superstars. Go to Gmail Labs, and enable “Superstars by Kai H and Julie W”. Then go to “Settings” and choose the Stars you want to use by dragging them from “Not in use” to “In use”. This is what I always wanted in chat… This let’s you see the photo/avtaar of the person who you are chatting with. Just enable “Pictures in chat by Dave C” and you are done. I remember getting hooked to Snake on my Nokia 3315. With time that old Snakey got lost somewhere in the maze of technology, but I re-found that old snakey hidden in Gmail labs.. Enable “Old Snakey” by Dave C.
Now relax, lay back and enjoy your favourite game, but do not forget to enable Keyboard shotcuts for Gmail before that, as you will need to hit “&” on your keyboard to play this game. I do not like all the widgets stacked up on the left side in Gmail, especially the Gtalk widget. I always wanted Gtalk widget to be on the right side in Gmail, and “Right-side chat” by Emily C just let’s be do that. Enable it from labs page. Now, you will see a button like this in your gmail. Do you get irritated by always being forced to format the mail to set your font and colors before sending it. Now all you have to do is enable “Default Text Styling” by Jonathan K from labs. Now go to “Settings” tab and set you default font and color. From Now on you do not need to format your mails everytime before sending them. 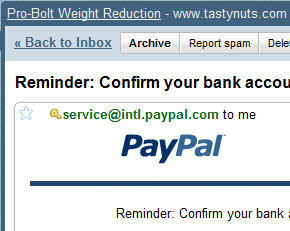 And you will be able to see this kind of key icon from certain senders which spammers try to fake. This only works for PayPal and eBay as of now. This feature let’s you archive a mail which you are sending. Enable “Send & Archive” by Pal T.
Oh… How could I hit the send button before finsihing it!!! Felt like that sometime? Now enable “Undo Send” feature by Yuzo F and you will never send intended or unfinished messages to anyone. Able to cancel sending mail. Even if the mail is sent, you will be able to “Undo” the send, but this feature will be available just for a few moments, before the mail is delivered to the receipent. Do you need to switch to the brwoser again and again to know if you have received some new mail? Imagine if you get to know of any new mails from the minimized browser itself… Enable “Title Tweaks” by Fedor K.
Telling you the number of mails in your Inbox. Have you created a large number of “Labels” to manage your mails… And obviously you do not want to all the Lables to take up all the space on left side in Gmail. So enable “Hide read labels” by Damian G & David de K.
Now, only Labels which have unread mails in them will be displayed and others will be hidden which you can access by clicking the drop down arrow. Want to insert images directly into your mail instead of sending them as attachments?? If you use Google Docs extensively like I do, you may like this feature which displays a Goole Doc widegt in which your recent Google documents will be displayed. 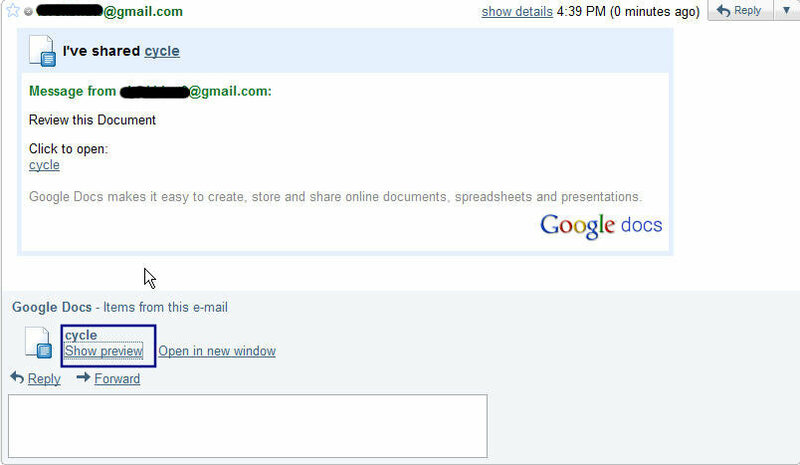 Enable “Google Docs gadget” by Claudia C and Ted C.
There is one more feature which is imbedded in Gmail itself but not many people know about it. Suppose you have logged in from some computer and instead of signing out, you just closed the browser and left. What if that computer is not a private but public computer!!! Gmail let’s you to sign out from all sessions other than the current one from the computer you are using. Just got to the bottom of Gmail, there you can see “Last account activity:”. Click on “Details” just next to it, there you can see from which all IP’s you have logged into your Gmail account in recent past, and there only you can “Sign out all other sessions” and relax. 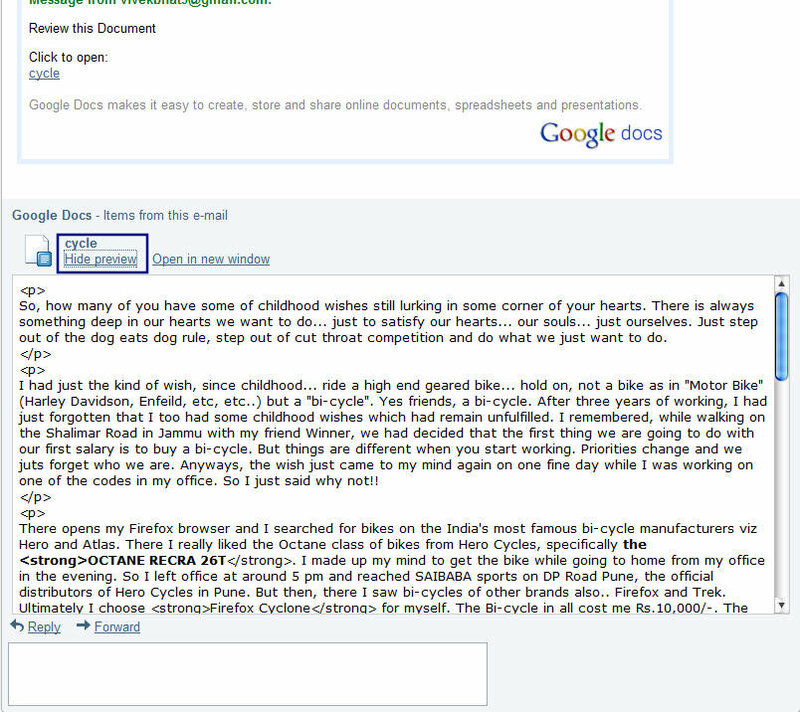 This entry was posted in Technical on March 22, 2010 by Vivek Bhat. Google Labs are good.. It is not good if you have a slow internet connection. And I feel due to google labs it may affect the performance of the page loading due to the extra processing which will be involved.